I just got home from the hospital checking on my hubby and I am happy to report he is doing much better, it seems we have turned the corner! I was able to speak to the doctor today and he said that my sweetie is responding nicely to the new medication. They want to monitor him for a little bit longer just to make sure that he stays on the right track and get a couple more test results but it is looking much better then yesterday! I didn't realize when I chose my one little word how quickly I would have to put it to work. Faith...it is a good feeling! So I decided to share a couple of random things! Do you ever check Pantone to see what the official color of the year is...well, I do, and guess what it is this year!!! Yep, it's a beautiful pink called Honeysuckle. I love this color and think you will be seeing a lot of it in the coming months! Tomorrow begins a journey I have been looking forward to for quite a while. 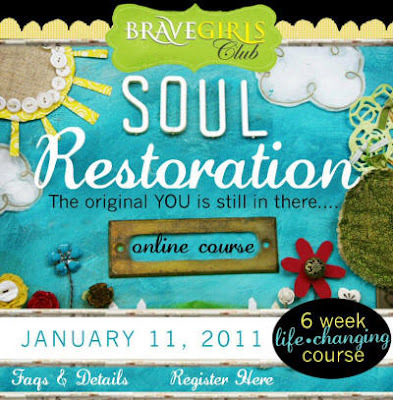 Soul Restoration...the online course from Brave Girls Club! I don't think I knew exactly how much I would need this when I signed up for it. I am ready! You still have until midnight tonight to sign up but if you just can't swing it or you are on the fence you should at least sign up for the daily truth emails??? Brave Girls is such a positive force and we sure need more of that in the world...what are you waiting for...go now!